Former UNC basketball player Rashad McCants spoke to ESPN’s Outside the Lines about his academic experience at UNC. McCants told ESPN that he not only took many of the “paper classes” in the African American studies program which have been at the center of the ongoing scandal. McCants also told ESPN that tutors wrote some of his papers and that head men’s basketball coach Roy Williams knew about the classes. McCants’ is just the latest in a series of stories which look like smoking guns. Over a year ago, I suggested the NCAA should be more actively involved in investigating the scandal (if they weren’t/aren’t already) based on improper grade changes. But that was before the NCAA re-issued its interpretation of the academic fraud rules, along with a Q&A Educational Column and a session at the NCAA Regional Rules seminars this summer. Before you go any further, step one is to ask whether the institution has determined that academic misconduct occurred. A finding of academic misconduct is entirely based on the policies and procedures of the school. 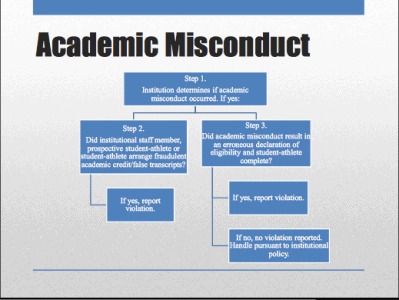 So long as the school follows its own policies and does not deviate from the process of finding academic misconduct, the NCAA cannot even get started with an investigation until UNC first determines there was academic misconduct. UNC has completed a number of investigations, some of which have found problems. But Steps 2 and 3 on the flowchart explain why these broad, statistics-based investigations are problematic for the NCAA. To find a violation, you have to be able to point to either specific fraudulent credit or specific athletes who were erroneously declared eligible and competed (i.e. but for the academic misconduct, the athlete would not have been eligible). Saying UNC has a systemic issue is not enough, the investigation has to get into the specifics. So if UNC does not consider steering athletes toward the paper classes to be a violation of academic policies, the NCAA cannot even start the process of finding an academic fraud violation. And if McCants had a paper written for him but would have been eligible even if he had failed the class, that is not an academic fraud violation. After McCants’ comments, the best reason for the NCAA to get involved is still the grade changes which were reported early last year. There are two other ways that the NCAA could investigate and ultimately punish UNC in this scandal. First, even absent a finding of academic misconduct, the arrangements for student-athletes can be impermissible extra benefits. The classic example of an extra benefit in an academic context would be allowing an athlete to enroll in a course when it is closed to other students. The NCAA decides what is and is not an impermissible benefit, not UNC. The other way the NCAA can find a violation without UNC finding academic misconduct is by finding that UNC deviated from its own policies. Given the time frame of investigations, that will be very difficult though. In general, a university’s procedure for investigating former students is much looser than the process for investigation current students, if one exists at all. If UNC is not required to conduct an investigation into allegations of academic misconduct by a former student, then the NCAA has no basis to question the quality of the investigation. As UNC athletic director Bubba Cunningham said, McCants can be interviewed by Kenneth Wainstein, who was hired by UNC to conduct yet another investigation. That may or may not develop information which allows the NCAA to get more involved. But McCants’s comments are not the smoking gun they appear to be until UNC decides they are.